Eye fillet steak is mild and subtle in flavour, as well as being very tender. It comes from the underside of the animal’s spine and does very little work, hence the tenderness. 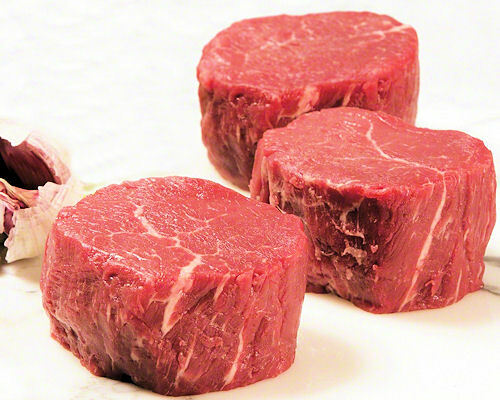 At Greenhill Farm, we only have eye fillet as a treat, as it is quite expensive, so I like to cook it properly. I’ve tried the only turn once method, but much prefer the “turn every 15-20 seconds” method as per Heston Blumenthal. To me it is less stressful and easier to get right. To begin, take your grass fed eye fillet out of the Greenhill Farm cryvac pack, put it on a plate, then cover and leave to thaw in the fridge for a day or two. A couple of hours before you want to cook it, bring it out and let it come to room temperature. Rub the steak all over with olive oil and season with salt, but only JUST before you fry it. Heat the pan to a high temperature and carefully add the steak. Flip the steak over every 15-20 seconds. The heat causes the juices to rise to the surface and when you turn it over the juices rush back into the meat rather than being evaporated off. Do this until the steak is cooked to your liking. It is most important to then rest the steak. This allows the juices to settle back into the steak and the meat to relax. It is good to rest it on a cake cooler over a plate to allow the heat to escape and cooking to stop. Rest for a good few minutes, season and serve. I like to make a sauce to go with it – nothing elaborate, just a creamy mushroom sauce. Fry some onions and mushroom lightly and then set aside. Put about 2-3 cups of stock (made from Greenhill farm bones of course!) in the pan and boil rapidly to reduce. Add some crème fraiche (or sour cream or double cream) and return the onions and mushrooms to the pan. Keep boiling until it has a syrupy consistency. Season to taste, pour over your steak and enjoy! "Best meat I've had in a long time!" "Fabulous tasty meat - I am converted!" "We can't eat any other beef now"
"Your meat is fantastic. I'm even contemplating a bigger freezer so we don't run out and I can take advantage of the bulk packs"
"Consistently excellent beef - the mince is a weekly staple and the steak is a treat"
"I didn't know beef could taste so good - now it's hard to eat any other beef"
"Absolutely beautiful meat" I come to the farmers' market especially for it!"